I am going to bet that not many people have heard of the “Overton Window”. There can be many reasons for this. One is that it is a relatively new concept. Another may be that is usually used in conjunction with the prevailing political debate. Finally, it was generated in a “Think Tank” type environment and those types of terms do not usually migrate out into the greater population. Be that as it may, I think it is a very interesting term in that to me it is just as applicable to business (and probably many more environments that I have not considered) as it appears to be to politics. First, a little history and definition as to what the Overton Window is and how I came about looking into it. 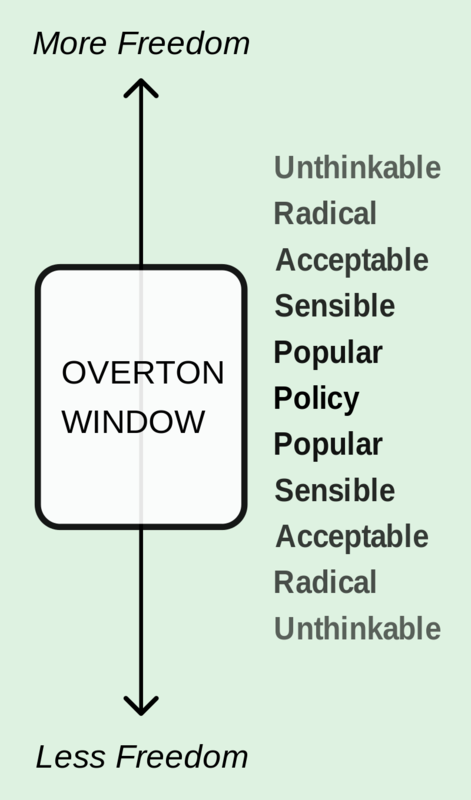 I first came across the term “Overton Window” while reading one of the plethora of political analyses purporting to explain what is currently occurring in American politics. It discussed how various individuals were responsible for shifting what was, and what wasn’t politically acceptable to discuss. As I wish to discuss business and not politics I won’t name any of the individuals but suffice it to say there are not as many people as you might think that are capable of or are shifting what is acceptable in the current political discourse. The majority of them are usually just credited with screaming about one thing or another, depending on which side of any given issue they happen to reside. So, basically the Overton Window is the range of ideas that are “acceptable” to talk about at any given time. That doesn’t mean that they are the correct ideas. It only means that they are politically correct, or ideas that can be talked about without significant fear of a negative response. We have all seen examples of what the possibly best solution to any specific problem may be, only to find out that the prevailing political climate renders this solution politically unacceptable. It also notes that this window can shift depending on a variety of factors. Ideas that may be in the window at one time, or for one administration, may not be in it at another time or for another administration. As I have noted before, reading about something like this always gets me to thinking, which as I have also noted before can be a dangerous thing for me to do. It got me to thinking about why so many organizations talk so incessantly about the need for change, but then react with an immune system like resistance response to those proposals that can in fact generate real change. It got me to thinking that the Overton Window is a limiting factor in that according to its precepts, only those changes that fall within the relatively modest window can or will be acceptable. True or significant change would probably place that policy outside of the Overton Window, which would mean that it is politically unacceptable for consideration. This would explain why only minor or incremental types of changes seem to find their way into the corporate (or political) application. Too great a change, regardless of its potential necessity or benefit would find itself outside the range of acceptable change for the then business (or political) administration. I’ll let you guess who’s proposed changes were within the Overton Window and whose changes were probably outside of it. I think what Overton recognized about politics is probably reasonably applicable to business as well. All organizations have a political aspect to them. This is the personal and interpersonal side of things. Stakeholders have committed to a then acceptable and approved course of action. Significant change or movement away from that direction could cause a perceived loss face or position. So, how can this change limiting window be moved or enlarged? In politics, the answer is relatively simple: Elect someone else. If those in office refuse to accept that a new direction is needed because of whatever commitments and ties they have to the current direction (or whichever special interest group), replace them with someone new who’s views more closely align with the new direction or change that is desired. Okay, so what do you do in business to expand an organization’s ability to change, since you can’t readily elect new business leaders? Therein lies the issue. Organizations are not elected. They are put in place from the top down. CEO’s are selected in a closed environment by Boards of Directors. The CEO’s then surround themselves with executives that will support and enable their programs. This type of directional change then cascades in one form or another throughout the organization. On the other end of the organizational spectrum, managers likewise look for team members who will also support and enable their objectives and assignments. With this sort of top-down approach to organizational structures it would appear that in order to affect a desired or needed change of any significant magnitude, you would have to make a change at least one to two levels above the desired change location in order to affect the Overton Window that is limiting the desired change. Normally, as a matter of course, changes of this type, or at this level do not occur easily in a business organization, unless the entire system, and its performance are under a great deal of stress, and by then, many times it is too late. I think the concept of the Overton Window does a very good job of explaining why organizations talk so much about the need for change but seem significantly limited as to the size, type and amount of change that they can actually affect. As long as the existent organizational team and structure remain in place, change of any real magnitude will be very difficult when the topics and paths lie outside the window of acceptable discourse for the existing team. While it may be desirable and sought after that change be made from “the bottom up”, this type of change can only really occur when the bottom of the structure, or in the political sense, the voter makes the change by electing someone else, and the management structure (those elected) listens to and responds to the mandate. In a business organization the mandate comes down from the executives, not up from the employees. Change in any environment is difficult. 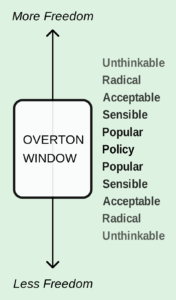 I think the concept of the Overton Window goes a long way toward explaining why so many organizations say they want to or need to change but fail to make any significant or meaningful changes. It is usually not until the situation reaches a point where it becomes incumbent to replace specific organizational or business leaders with others, who may have a different window as to what is now the new and acceptable discourse on what and how to change. I’ve been trying something new lately when it comes to meetings. I started by looking at the number of meetings I attend. I don’t think I am too far outside the norm by saying, I seem to attend a significant number of meetings. I think I have said this before. We may have hit the point where we seem to establish our credibility and measure our value contribution by the number of meeting we attend. We have now associated attending meetings with making progress. I then started looking at what actual portion of the meeting was I actually engaged in or contributing to. I am sure there are those that would question my engagement or contribution to any meeting I attend or participate in. The point here however, is that I found that there were specific portions or times during meetings where the topic being discussed was germane to me and I needed to be fully engaged and participative. The rest of the time, maybe not quite so much. When I looked further at this relative “down” time I would experience in a meeting, I found that a significant portion of it was associated with what I will call “related” meeting topics, not the specific meeting topics. I’ll give an example. I was in a project review meeting where the objective was to detail the status of the project. An issue was identified. This is a good thing. But it quickly caused the meeting to go off the rails. Instead of identifying the issue, and assigning those responsible to work out a resolution, those responsible for working out a resolution proceeded to try and work out their solution – during the review, with everyone else waiting to contribute their portions of the review. The issue was important. But more so specifically to a subset of all those in attendance. The rest of the meeting attendees (myself included) time was less than efficiently spent listening to the attempted resolution of a topic that may not have been completely defined, or fully germane to their areas of focus. In other words. We sat there on the call. The meeting dragged on. Another issue was identified which created another attempt at an on-line resolution. The meeting ran out of time so that those at the end of the agenda had to curtail their reports. The meeting ran over the allotted time. It seems that it may have its roots in science (Physics actually, and as we all know I am extremely fond of Physics). And as we all know, if it is science, it must be true. As with any scientific theory, several corollaries have been created as a result. All of this got me to thinking. And, as we also all know, this can be a dangerous situation for not only me, but all those involved or effected. It seems to me that meetings have taken on a status where it’s okay to ramble and take extra time, because invariably we make excuses for, or accept this kind of meeting behavior. The end result is that the meeting does achieve is goal, but it takes far more time than anyone is comfortable spending, and no one feels a sense of accomplishment when it is done. My answer to this issue was pretty simple. I made my meetings shorter. Instead of having a one-hour review, once a week on Wednesdays, I scheduled two – one half hour reviews on Tuesday and Friday. I didn’t reduce the agendas or topics either. We covered everything in each meeting. You might ask how this is possible? The answer is really very simple. I became ruthless in cutting non-specific meeting discussions off. If the meeting is a review, then it was a read-out, or reporting delivery only. If an issue was identified, it was immediately taken off-line, with an action item and an owner identified and would be resolved so that it could be read out and reported during the next half-hour call. It took a couple of meetings for the team to understand and get the rhythm of the approach, but the results have been very apparent. The project is moving faster. Ownership of issues and their resolution is much clearer. Progress is accelerated. Just to review: we are spending the same total amount of time in meetings on the project reviews, but we are making more, and faster progress toward our objectives. Looking back at Horstman’s Corollary to Parkinson’s Law, meaning if work expands to fill available time, that it should also contract to fit available time. Parkinson’s Law would mean if we schedule a one hour review we will conduct the meeting in such a way as to fill the full hour (and then some). Horstman’s Corollary would say that if we reduce the available time from one hour to a half-hour, we should be able to get the work done in that interval as well. They both seem to be correct. If it is a read-out meeting, read out only. Issues need to be taken off line, resolved and then read out at the next read-out meeting. If it is an issue resolution meeting, resolve the identified issue only. Don’t read out. Don’t work on other, related issues. Many times, presenters do not know how to end their presentations. Sideline discussions, anecdotes, stories and all other manner of communications needs to be curtailed. Then move on. Just because non-germane topics come up does not mean that they are not important topics. Clearly note them. Assign an owner and a time for resolution – and move on. Do not allow the group to lose focus on the topic at hand. This will keep everyone engaged. If it is your meeting, then it is your responsibility not to waste everyone else’s time. Stay on topic. Cut them off if necessary. Assign the action items. Publish the meeting minutes. I didn’t set out to prove what are widely regarded as accurate, if not tongue-in-cheek axioms regarding how time is spent in business. I actually set out to see if I could start to reduce the amount of “down” time I was spending in meetings in general. I am reasonably well convinced that the reason we have so much multi-tasking during meetings is due to the length and engagement requirements we now seem to expect in our meetings. We know the meeting will be longer than we want. We know that we will really only need to be fully engaged and aware for a relatively small percentage of the time that the meeting is conducted. We know we will be bored the rest of the time. The alternatives are to either multi-task, or to reduce the total time of the meeting in order to reduce the down time. Multi-tasking is the meeting attendee approach to solving their individual wasted meeting time issue. Reducing the actual meeting time is the meeting owner approach to solving everyone’s wasted meeting time issue. Conducting shorter meetings will take significantly more effort on behalf of the meeting owner, and by extension some of the attendees, but I have found that you can actually get more done in the meeting by taking this approach. And I think that everyone in the meeting appreciates that, since that is supposed to be the objective of the meeting in the first place. Every now and then I have a good idea. Depending on whom you ask you can get the entire gamut of responses as to how often this type of event actually occurs. My mother seems to think just about every one of my ideas is a good one and that they are the result of the fifty percent of my DNA that came from her. It seems to me that she didn’t always think that. I think it started when I got the idea of graduating college and moving out. My wife on the other hand seems to think that I might have a significantly lower hit rate for good ideas as opposed to the total number of ideas that I have. A much, much, significantly lower hit rate. I think the number of good ideas that I have probably lies somewhere between these two boundaries, but it is hard to tell which is which until I spend some time thinking them through. A good example of this process can be seen in how I write these articles. I keep a pad and pen around where I capture all the ideas that I have for topics for future articles. When I have an idea, I write it down on the list. The list grows and the articles get written. Seeing the list helps me visualize and formulate what ideas I want to convey and what I want to say. When I don’t capture my idea on the list I have a tendency to forget what my idea was and then I go through the day kicking myself because I have forgotten what was obviously going to be a great topic. I didn’t get this process from school or writing class or anything like that. I got it from work. I always keep both a notebook and a whiteboard (both topics of previous articles) in my office where I would (and still do) capture the things that I felt needed to be done. I know that writing something down instead of typing it in is old school, but so what. As of that point in time that the topics got written down on the article list or objectives were written on the white board, all of them were good ideas. Ideas such as “insult the boss” or “complain of wife’s attire” are not good ideas and didn’t make the list. I was obviously proud of this fact. I then started working through the ideas selecting the topics to write about or prioritizing the various things I felt needed to be done in the business. I would start writing articles or further outlining activities on the white board or charts. I would very rapidly start to see which of my topics and activities would be fruitful and relatively easy to generate positive results. I would also see that some other ideas and activities would also be good, but would require deeper thought and more effort to bring to closure. It was some of these activities and articles that I have been the most proud of. I would also begin to see that in some of those topics and ideas, regardless of how hard I worked them at this point in time were not going to yield something that would work out well enough that I would want to sign my name to. These items and objectives were not then discarded. They were put back into the holding file for further consideration and thought. Some have stayed there a very long time and probably will never see the light of day. Some have stayed there a relatively short period of time before the translation occurred between what I had and what I wanted. Some were left on the white board to remind me what I needed to think about and what I felt needed to get done. What brought this mental process to mind was my last article, the one that I didn’t write and didn’t post. I had a great topic. I thought it would be one of those easy to write and be oh so proud of it ones. I got started. I soon realized the path that I was on for that topic was taking me down the wrong road. Try as I might I couldn’t see a way to get onto the right path and convey the wisdom that I was absolutely sure that I had inside of me. I had to put it back in the holding file. It wasn’t ready. I suspect that if my wife ever reads any of my articles that she is smiling right now and commenting to herself that I should probably do that with far more of my ideas. The point I am making here is that at the start all ideas start out as good ideas. It is not until after we work on them and work through them that we can ascertain the feasibility and applicability to the goals that we have. Some make the grade. Some do not. I have actually found that the majority of both my article topics and identified business activities end up at least in part resulting in a product that gets put forth into the world in one form or another. There will always be those that will want to poke holes in your ideas, or articles for that matter. I have gotten some interesting comments regarding some of the topics and articles I have written. I am pretty sure that some of their suggestions and conditions that they have ascribed to me regard capabilities that are probably either genetically or biologically impossible. But it doesn’t stop me. It really doesn’t even slow me down. There will always be those in business that will at first adhere to the “Not Invented Here” school of ideas (commonly called NIH Syndrome). It is at this point in time that your metal will be tested. How feasible is your idea or proposal? Have you thought it through? Many of us have a tendency to propose an incomplete or not fully thought through and formed idea. It might be a good idea that is worthy of going on the list for development. However proposing it prior to thinking it through would be like publishing an article before it is fully written. What is the first thing most people do when they hear a new idea? They try to shoot holes in it. They look for the weaknesses and the reasons that it will not work. It is the common perception that if one chink in the armor can be found, if one flawed aspect of an otherwise glorious and eminently functional idea can be identified, then by association the entire idea can be dismissed as unworkable. It may be human nature where the inherent resistance to change may be built into our collective DNA. I don’t know. Sometimes it seems that we would rather continue down the known road, which we know will not get us to where we need to be, instead of changing direction and setting out on a road whose final destination is not fully known but at least is going in the direction we want. When I catch myself resisting someone else’s new ideas I consciously try to take a step back and try to be more receptive. Even so, it takes an effort. Thinking through the new idea will help you uncover any potential issues and weaknesses. It will help you prepare for the NIH syndrome that you will inevitably encounter. It will prepare you with responses to potential objections. It will also save you some embarrassment if your idea turns out to be one of those that actually should have stayed on your list or white board for a little while longer. Most everybody at one time or another has good ideas. Some get captured and some get forgotten. It is the interval and the effort that goes into the idea after it gets captured and before it gets proposed that is the key. It can be the difference between being just another “off the cuff” suggestion and a studied and considered proposal for improvement. A good idea matters. Thinking it through matters even more. I have a friend Leif, who lives up in Wisconsin. He used to live in Texas and moved BACK to Wisconsin of his own volition. This fact in itself should provide some insight into the type of individual that Leif is. Be that as it may, I still consider him a friend. We stay in touch via electronic means. I keep track of him in some small way because Leif loves to post on Facebook. He posts a lot more than I do. Sometimes he posts things that I wish I had posted. I don’t post much on Facebook. Many times he posts things that I am proud to say that I had no input into, no contact with and would not have posted even if I did. It could be said that Leif swings at just about every electronic pitch. When you do that there are going to be a lot of whiffs and foul balls, but on occasion you will make good contact and knock one a long ways. Leif recently posted a Facebook link to a Youtube video about a speech given by David Foster Wallace at the 2005 commencement at Kenyon College called “This is Water”. This was one of Leif’s home run posts. I have a tendency to look at the interconnected nature of things and how information that may be applicable in one realm is actually also applicable in another. This may provide some insight into what type of an individual I am. The realm that I usually end up trying to apply this interconnected information to is the business environment. Sometimes I see the hyperbole and Monty Python-esque absurdity of what is going on. I know I am dating myself here, but sometimes there just is no other theater of the absurd that can fit the reality of business like the Pythons with their “Minister of Funny Walks” and “Lumberjack Song”. Sometimes I get what I hope is a real flash of insight into something that may be useful in actually continuing to navigate the difficult business waters. I am hoping that David Foster Wallace, via Leif might have provided me a flash, along with a little absurdity, that I will try to apply to our business world and pass along here. Mr. Waters in his speech discussed the fact many times in life we will find ourselves on what he called our Automatic Default Setting. He described the automatic default setting as the way we deal with things when we are not consciously thinking. This idea struck a chord with me. The idea that we have an automatic setting in how we deal with the world around us seemed to me to be pretty applicable to how we deal with the business environment as well. The idea of automatic default setting was used primarily in addressing the mundane such as driving in traffic or standing in line. The net of this approach was that it leads to viewing people in these instances as obstacles slowing you down and being in the way. Is this beginning to sound familiar to anyone’s work environment? I am going to pause here a moment and note that in business I have found that occasionally…okay, more than occasionally, in fact pretty often this automatic default setting is so accurate that it is painful. What I found particularly interesting and applicable is that Mr. Wallace did not dispute this in life either. What he looked at and brought forward was that people have the ability to be aware of their default settings and instead of perceiving the world through them; they can choose to instead to be aware of them. This will affect how you think. This is always a good thing. Now this sort of discussion of self awareness is usually reserved for some sort of existential high-brow literary artifice. That is not going to happen here, mainly because I don’t think I know how to act high-brow. People who know me can probably corroborate this statement. One of the points that Mr. Wallace did make was that being aware of your automatic default setting and choosing not to operate at that setting takes effort. It takes a will and a willingness to not to just go along without thinking. You have to be able to consider possibilities that are outside the standard way that you think. However, if someone asks or tells you to think outside the box, you can probably be reasonably assured that they are operating on their standard default setting. It is my experience that there may be some people who may not be able to operate on any setting other than automatic default even if they wanted to. I am not trying to invalidate Mr. Wallace’s supposition here. I’m just saying. With this rejection of the automatic default setting, we may need to revisit our beliefs that the Sales teams are a bunch of over promising, money driven, lying swine. We need to realize that they may not in fact be lying all the time but probably only when they are talking. We need to reject the setting that all finance and accounting team members are slow moving, detail oriented, conservative, money driven sloths. We need to understand that we only see them in the business environment and that at outside of the office they may not be entirely conservative, particularly when it comes to decisions regarding their footwear and whether or not they get the oil in their cars changed before, after or exactly on the recommended mileage. All joking aside, I found David Foster Wallace’s approach to being more aware of the everyday items and thoughts that we take for granted, that we utilize our automatic default settings on, to be scarily accurate. It takes effort and will to think of each event, person and process as a potentially new experience that should not be treated to the same default setting response. If we ever wonder why we, our business or our company seem to continually be asked to solve the same problem multiple times, it could be because everyone has their default settings on and we provide the same responses to what we perceive as the same stimuli. Is it possible that we seem to do the same things over and over again because we have our default settings on and don’t bother to take the effort to consider the possibilities associated with something new? We have already seen it, or something like it and it is just easier to revert to our default setting, respond and move on. I don’t know if Mr. Einstein and Mr. Wallace would appreciate me correlating their works, but like I said, I do have a tendency to look at things inter-connectedly. I have already taken the opportunity to put Mr. Wallace’s ideas into practice. We have all had business issues that seemed to have a circular nature to them. Group A was dependent on Group B for an answer. Group B was waiting on Group C for input. Group C could not get the information it needed from Group A. I am sure we have all been in more than our share of these types of solution merry-go-rounds. They seem to becoming more the norm than the exception. They can go on for weeks. By taking the step back and not accepting that these issues were the norm and by relooking at the “standard responses” we were able to break the cycle and start making progress toward a solution. We took the process off of autopilot, required something other than the default setting response, and started to make progress. I don’t know if Leif will ever be able to provide another post that will resonate with me the way “This is Water” did. After all, the previous several hundred did not. Just since I started work on this topic he has already posted two more items regarding opportunities and drinking. It is interesting in that both of these later posts seem to have several “Likes” whereas “This is Water” did not get that sort of appreciation. Maybe some of these people need to change their automatic default settings too. Thanks Leif. I thought “This is Water” by David Foster Wallace was excellent. What are You Paid For? I am a big believer in the alignment of objectives, goals and incentives for a business to achieve its maximum potential. If everyone is working toward the same goals and is compensated on those items that bring the most value to the business then you should have a structure that is both efficient and focused. Is that enough? I was on an organizational wide call where there was a general discussion regarding the business structure and potential new opportunities in the market, and how to most effectively and efficiently pursue them. The group conducting the call was asking for input and ideas from the team based on the fact that the team members were the ones closest to the markets and issues and should therefore have some of the best ideas how to deal with them. This made sense to me. Now I understand that incentives are designed to try and generate desired behavior, but where do we cross the line and start asking for incentives for people to “think”? My logic here is that if you can come up with a better or more efficient way to do your job, you should implement it. If it truly is better, you should be able to exceed your existing objectives and then be compensated better based on the current incentives associated with your role. This is what you are paid for. We are all essentially knowledge workers. We should try to generate the maximum value for our businesses possible. We do this by applying our knowledge to the best of our abilities. Incentives should be based on the output generated from the application of knowledge and ability, not the application of knowledge and ability itself.